Employers regularly cite a lack of commercial awareness and other transferable skills in new graduates. To address this issue, we developed a suite of employability-focused modules (or courses) under the umbrella of Business Skills for Chemists. The modules were, and continue to be, optional for all Chemistry undergraduates, with one 10-credit module (of 120 credits per year) for each undergraduate year of study. A context-based learning approach and group work was taken in each case, to introduce students to a wide range of industrially focused experiences. A retrospective longitudinal qualitative study of three students who took all three modules during their degree was undertaken to better understand students’ experience of the modules, and the impact on their career decision-making. This research was undertaken to gain greater insight than the regular student feedback obtained at the end of each module. During the modules and at the end of the degree, students identified that the modules had helped them to develop a wide range of skills and capabilities. Reflection is an essential component of the learning experience, ensuring that the students not only experience a skills-rich curriculum, but also have the ability to reflect upon and derive benefit from their experiences. The modules had also been prominent in their career decision-making, by introducing the students to a wide range of career options for Chemists, through the curriculum. The Chemistry Industrial Advisory Board of the University of Leeds, and other external contributors to the modules. Belbin Associates UK. (2016). Team role summary descriptions. https://www.belbin.com/media/2307/belbin-team-role-summary-descriptions.pdf. Accessed December 2018. Hanson, S., & Overton, T. (2010). Skills required by chemistry graduates and their development in degree programmes. Hull: Higher Education Academy, UK Physical Sciences Centre. http://www.rsc.org/learn-chemistry/resources/business-skills-and-commercial-awareness-for-chemists/docs/skillsdoc1.pdf. Accessed December 2018. Pearce, S. (2016). Authentic learning: What, why and how? E-Teaching: Management Strategies for the Classroom, 10. http://www.acel.org.au/acel/ACEL_docs/Publications/e-Teaching/2016/e-Teaching_2016_10.pdf. Accessed December 2018. Pugh, S. (2014). Getting down to business. Education in Chemistry, 51(5), 18–21. http://www.rsc.org/eic/2014/09/business-awareness-undergraduate-teaching. Accessed December 2018. Pugh, S. (2017). Teaching career skills to undergraduates. 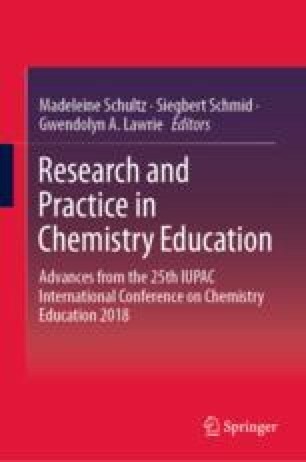 Education in Chemistry, 54(1) https://eic.rsc.org/feature/teaching-career-skills-to-undergraduates/2500262.article. Accessed December 2018. QAA. (2014). Subject benchmark statement: Chemistry. https://www.qaa.ac.uk/docs/qaa/subject-benchmark-statements/sbs-chemistry-14.pdf?sfvrsn=99e1f781_14. Accessed December 2018. Royal Society of Chemistry (RSC). (2017). Accreditation of degree programmes. http://www.rsc.org/images/Accreditation%20criteria%202017-%20update%20july%2017_tcm18-151306.pdf. Accessed December 2018. Royal Society of Chemistry (RSC). (n.d.). Tackling global challenges. www.rsc.org/campaigning-outreach/global-challenges/. Accessed September 2018. Seery, M. (2015). Putting chemistry in context, Education in Chemistry, 52. https://eic.rsc.org/feature/putting-chemistry-in-context/2000106.article. Accessed December 2018.